I just hope soon people feel comfortable with debt levels. If consumers keep paying down debts, we could see a Japan-style deflation. House prices are still going down. With real estate and wages falling, I am not sure we are clear yet of the deflationary woods. Did anyone in Japan in 1991 predict "Well, we have another 20 years of asset deflation ahead?" Debt sleeps with the devil...You are a slave when you subscribe to debt....While Ben the insane punishes savers and the prudent.. 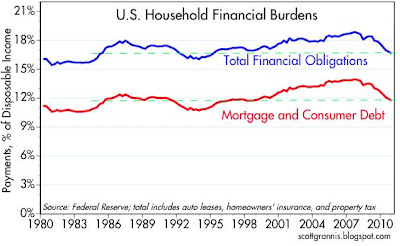 The issue is not the level of debt it is household net worth. Recovery would be here if household net worth reached 120% of its 2006 level - the level it was expected to reach when the economy was strong. The issue is compounded by demographics. The large cohort of people approaching retirement are deeply affected by the collapse in net worth because they are in the asset accumulation phase of their lives. The window for addressing retirement needs is short. Add to that what has happened reductions in Social Security and public sector pensions. Recovery will be long and slow. mr grannis's brain. right here. I have to agree this is encouraging. But government debt is growing and sooner or later this will attack and affect households. 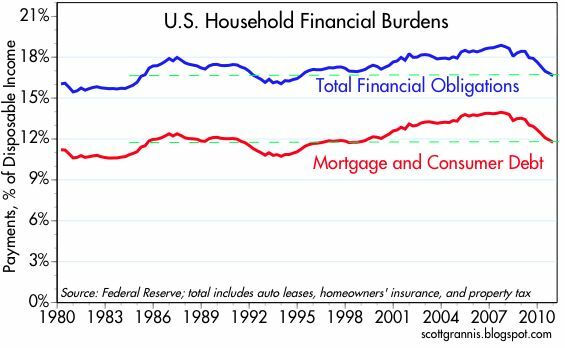 Sure deleveraging is happening but maybe not as fast as we think. Worse than a banker shill--I am a fan of three to four percent inflation for several years. I even go so far to say I enjoy prosperity and boom times! To your point, I have no connection to the banking industry, other than as an ordinary customer. One aspect I found troubling is the drop in credit card debt that was entirely due to write-downs (January). I wonder how much of the reduction we are seeing here is actually debt payoff, as opposed to debt pay down.